Last year I went to Dunk! Festival for a day. It was my first time at the festival and I was blown away with the professional yet relaxed organisation! This experience lead me to this Ricotta stuffed potatoes recipe that has been a delicious side dish to the herb crusted salmon. First of all I want to explain why this festival was a great experience. First of all the bill was filled with superb post-rock/-metal minded bands. Maybeshewill, The end of the Ocean, Ornaments, Year of no light, Amenra, … to name some. They all played fantastic sets with a great light show and a perfect sound! Those interested in the genre: scroll down and find a spotify list where you can explore some of the named bands. Besideds the nearly perfect approach towards music the festival comes with a verry laid back atmosphere with eye for attention. The picture above is just one example. You see the band Ilydaen playing in the middle of the crowd. This was the first gig I attended at the festival and it even wasn’t the first thing that charmed me over there. Right before that moment I entered the festival and while I was looking for the entrance (I was already on the festival ground without being aware…) I saw the festival chef walking down the festival ground with a large package minced meat. They spent the whole afternoon rolling meat balls to serve at six o’ clock. Not only did they serve fresh cooked meals they also had a foodtruck with superb stuffed potatoes. I had one with bacon and clove spiced apple sauce. 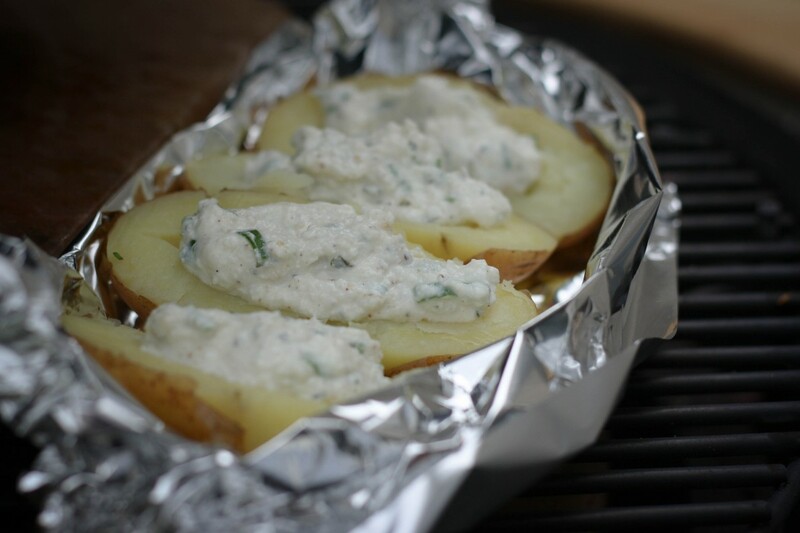 Suddenly potatoes seemed pretty attractive and the first sparkles for this ricotta stuffed potatoes were formed. Since my wife isn’t fond of potatoes I mostly made the same succes formula over and over again: Baked rosemary potatoes… Delicious but knowing those stuffed potatoes were delicious I wanted to try out something different. 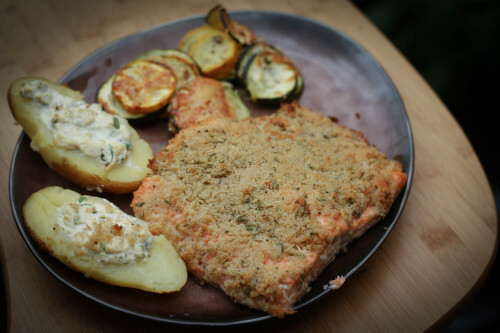 Since the flavours of the recipe I tasted at the dunk festival wouldn’t combine well with the Salmon and Zucchini casserole, I had to look for something different. I had the ingredients in the picture above at home and I thought they would form a great match. And I was right. The combination was delicious. My wife used the filling as an addition to the salmon and skipped the potatoes… Guess she’ll never be a good girl as far as potatoes are involved… I on the other hand was amused by the result (I’m not a though eater anyway so maybe you need to try for yourself). As you can see the potato at the bottom has a little bit of herb crust on it! It’s was a great addition if you ask me. I will add them to all potatoes next time! The result got me motivated to make more of them and try out other combinations! The ricotta stuffed potatoe combines well with the Fig glazed chicken I shared a while ago. If you are aware of other great stuffed potatoe recipes you think I need to know about I hope you share them over here or at the Facebook page. Cook the potatoes with skin on for a half hour. While cooking the potatoes you have some time to make the ricotta filling. 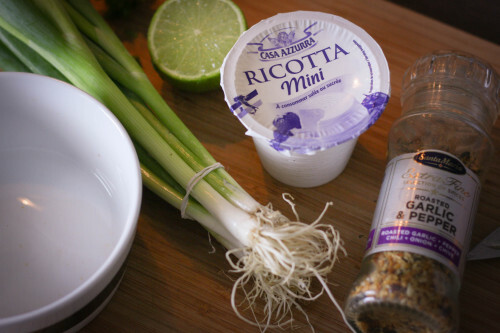 Start by mixing the ricotta cheese with a tbsp. of garlic & pepper flakes, finely sliced basil leaves and spring onions. Grill the lime and squeeze out the juices (this will make them a little bit sweeter). Cut the cooked potatoes in half and spoon out the heart of the potatoe. Replace it with the Ricotta stuffing. Put the potatoes over indirect fire at 180°C for about 15 minutes. They will look like the potatoes in the following picture when ready!